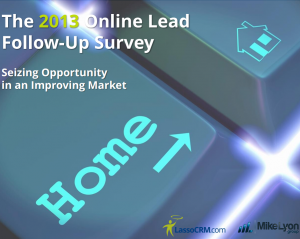 The results of the 2013 Online Lead Follow-Up Survey are in, and they are surprising! Last year, many home builders and developers saw higher numbers of qualified traffic due to improving market conditions. Also, according to the National Association of Realtors®, 92 percent of homebuyers shopped online. Yet, online lead follow-up activity remained flat for the majority of builders, and in some cases even declined. 41% of communities did not return an online lead’s email. 74% did not call an online lead back. 35% did not respond at all to an online inquiry. What does this mean for you? An incredible opportunity to claim more market share, simply by doing what your competition isn’t – following up! In the latest Lasso webinar on lead management, Mike Lyon discusses, in detail, five things you can do now to follow-up effectively, and turn more qualified leads into appointments and contracts. Start converting more online leads now! For specific details on 2013 follow-up activity, you can download the 2013 Online Lead Follow-Up Survey here. Have questions or want to know how to manage your leads more effectively? Email us today.